Plastic fancy bags handicraft training closing ceremony was conducted in Vocational Education Centre, Myanmar Maternal and Child Welfare Association Headquarter on 5th September, 2018. This training is intended for the family income generation. 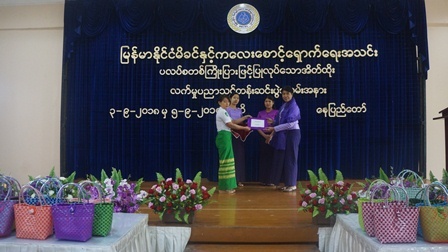 At the closing ceremony, MMCWA’s President Prof. Dr. San San Myint Aung delivered the closing speech and gave certificates to the representative of the trainees. After that, MMCWA’s Treasurer Dr. Le Le Yi gave document of honorary and gifts to the trainers. Assistance Station Officer Daw That Yee Mon from Ministry of Home Affairs gave a feedback by speech of thanks.